The Philadelphia Eagles and left tackle Jason Peters have agreed to a one-year contract extension, per the team’s official Twitter account. Peters was originally set to make $7.75 million in 2019, but the two sides came to a new agreement today, one that is worth a maximum of $10 million with $5.5 million guaranteed. 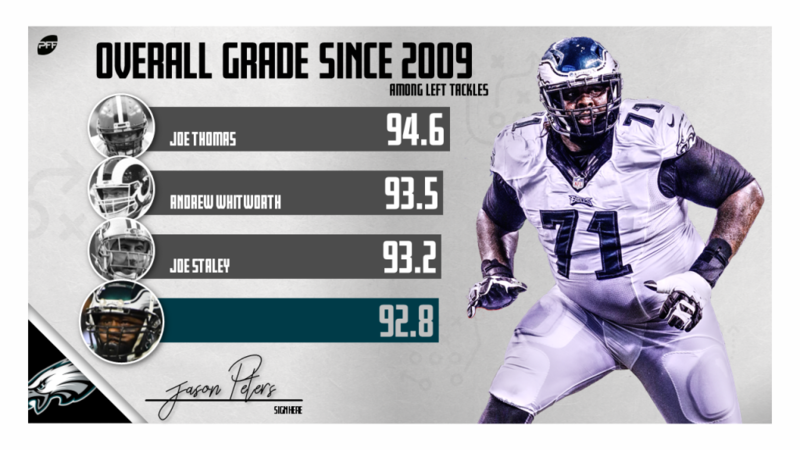 Entering his 15th season in the league, and having just turned 37 years of age, Jason Peters is still one of the most reliable left tackles in the NFL. In his 13 seasons within the PFF era (2006-present), Peters has graded above 70.0 in all but the 2018 campaign, above 80.0 in eight of those seasons, and above 90.0 in three of the seasons. Throughout Peters’ incredible career within the PFF era, Joe Thomas (11) is the only left tackle who has accrued more 80-plus-graded pass-blocking seasons than Thomas’ eight, while only Andrew Whitworth (63) has finished more games without allowing a single quarterback pressure than Peters’ mark of 44. All told, including his postseason appearances, Peters has allowed 55 sacks, 46 hits, and 192 hurries across his 5918 pass-blocking snaps since 2006; his allowed pressure rate of 5.0% ranks eighth among the 49 left tackles with at least 2000 snaps pass-blocking snaps in the PFF era, while his pass-blocking efficiency of 97.1 ranks eighth. His career overall grade of 95.6 ranks second to only Joe Thomas (97.0) among left tackles, while his career pass-blocking grade of 91.2 ranks fifth. While Peters did record a career-low grade of 69.6 in 2018, much of that was to do with his downfall in the running game, where he turned in a run-blocking grade of just 62.4, 39th among all offensive tackles. He was still his usual, stout self in pass protection, however. On 587 pass-blocking snaps across 18 games, Peters allowed three sacks, nine hits and 26 hurries for a pass-blocking efficiency of 96.5 that ranked 25th among the league’s left tackles. His pass-blocking grade of 75.9 ranked 21st. While it was clear by his 2018 showing that Peters is starting to slow down, he remains one of the league’s best options to man the blind side. The Eagles and Carson Wentz will undoubtedly rest easy tonight, knowing that they have the security of Peters for at least one more year.